Can you really have that much fun being over 400 feet straight up? Yes! There are so many fun and interesting things to do at the Gatlinburg Space Needle, but before you plan to enjoy all of them, make sure you visit the Space Needle itself. It overlooks Gatlinburg the surrounding Smoky Mountains and has a 360 degree view with free view finders. It’s packed with information about Gatlinburg and Smoky Mountains. You’ll know which direction you’re looking and what you’re looking at. The Arcadia at the Space Needle is a 25,000 square foot, two-story amusement center with latest video games and lazer tag. They even have a hurricane simulator if you’re a thrill-seeker! If you’re looking for a great place for date-night, the Space Needle is it. They have a VIP Treatment just for you. 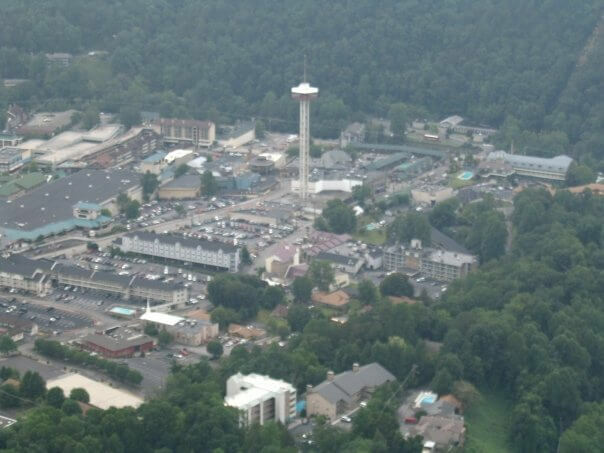 It includes two adult admissions to the observation deck and higher learning about the Gatlinburg area. Plus you get two Lazer Runner admissions and a Arcadia Play Card. Lock in the savings online with their big online discount! With all this fun and excitement, you’ll want to try the Slice Pizza Bakery for Italian food and New York Style pizza in Gatlinburg. Not much for pizza? Try a calzone, sandwich, or a salad. The other nice thing is you won’t have to go far to enjoy this great food because it’s at the base of the Gatlinburg Space Needle. Need the perfect escape from your work (or any other excuse to have a blast)? Then the corporate party package is for you. It includes: One Space Needle ride for up to 25 guests, 1,000 Arcadia tokens, two 15-minute games of Lazer Runner for up to 20 guests, five giant hand tossed pizzas, 50% off additional pizzas and fountain drinks, and 20 fountain drinks. There’s also other party packages for birthdays, gathering, graduation, or other type of gathering you might have in mind. If a comedy show is what you’re looking for, IRIS Theatre has that and more. Guy Michaels puts on hypnotized comedy show and family entertainment. Next the Head Case, be prepared to be amazed when the Mentalist is standing in front of you, reading your mind and predicts what you will say. After the Mentalist you can see “A Brit Of Magic” with Keith Fields. You’ll see a combination of magic and comedy. Keith has appeared in New York’s Broadway, London’s West End and Las Vegas Strip, even opening up for Robin Williams. There’s also a new show coming to the line-up in 2016 with magic, mindreading, and mayhem! For out more things to do in Gatlinburg, check out the Gatlinburg Attraction Guide brochure.